Would you like to feel beautiful and confident with every shower? Could a beauty soap be more and make every shower the perfect bathing experience? Transform your daily shower into an indulgent one that will make you feel special every day with fine fragrance skin treats from Lux Indulge in the newest jewel from Lux- Saffron glow The worlds best perfumers at Lux took the goodness of saffron, an age old secret of beauty with a distinctive, musky and floral aroma and blended it with white cream to craft the perfect mix to leave your skin brighter to bring out your beauty with every shower Enhanced with floral beauty oil to leave your skin smelling as fragrant as a flower even hours after your bath It’s moisturising lather makes for an indulgent bathing experience leaving you with petal soft skin while giving gentle yet ultimate cleansing The LUX Perfumed Bath Collection of Beauty Bars blend rich lather and sophisticated fragrances, crafted by the world’s best perfumers that help women feel fabulous, every day So let the pampering begin right away and treat your skin to the ultimate bathing experience, because you are so much more and you deserve so much more. Try now! Explore the entire range of Soaps available on Nykaa. 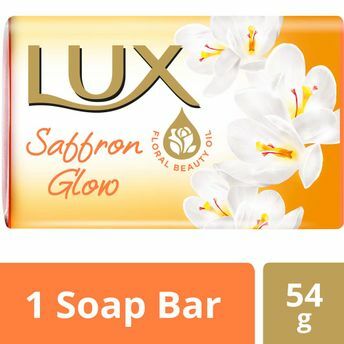 Shop more Lux products here.You can browse through the complete world of Lux Soaps .Alternatively, you can also find many more products from the Lux Saffron Glow Soap Bar range.